A trend that is bubbling up in neighborhoods across the continent is the resurgence of the corner store, that’s more than just a place to buy milk. There are community hubs that double as meeting spots. There are delis and bodegas that boast daily line-ups for their legendary sandwiches. And there are urban reinventions of the oddball general store where you can get everything from a hammer to a Mother’s Day gift. Independent corner stores have been around. As preferences shift towards local businesses, some local mom and pop shops are highlighting their unique qualities through a highly curated offering and design cues, making their corner store a destination. The Lucky Penny Corner Store and Cafe in Toronto has a cozy countertop where you can eat pistachio-rose donuts, and a garden with Muskoka chairs, where parents visiting the nearby park can take a moment to relax with their little ones on their way to the playground. Their frozen foods section makes dinner time easy and healthy, with locally made meat pie, pasta, and a beautiful small selection of fresh local produce. The key to creating a meeting place corner store is a limited seating area, and snacks such as baked goods, coffee, homemade soup and sandwiches. Some also host community events such as pumpkin carving competitions and book readings by local authors. Lucky Penny uses butcher block counter tops and natural wood details which compliment the exposed brick walls. Handwritten menus and messages on chalk boards, glass jars, pedestal cake stands, and crisp, clean white font on black signage all make for a pleasing blend of hi-lo design details. Ask any New Yorker about their favorite bodega or delicatessen, and you will likely receive an almost poetic response. Some of these famous spots been around for decades, and— in spite of weathered signage, peeling linoleum, and the use of post-it notes as menu boards— inspire faithful lunch crowds to line up for their wares (and buy some gum and garbage bags while they’re at it). Many stores emulate certain cues to offer an updated version of the New York Bodega, by using the monochromatic awnings with retro-looking fonts, tile backsplashes, stainless steel countertops and neon signs to highlight a special meal deal. The focus of this offering is a delicious, unique and inexpensive meal that has been made in the store. 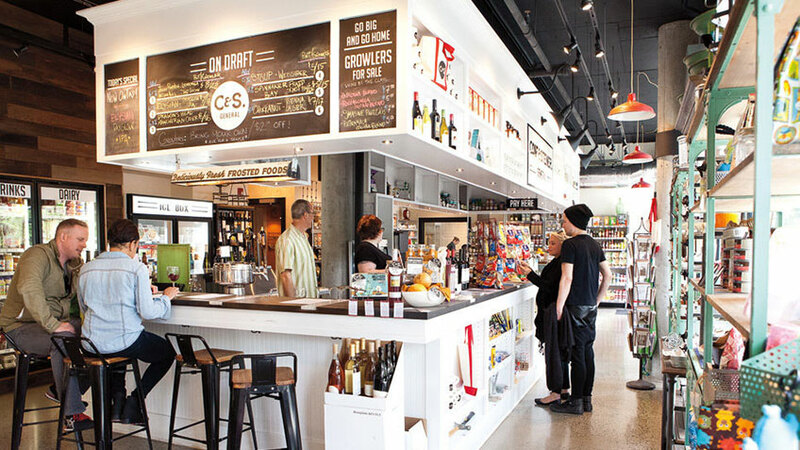 The General Store is seeing a resurgence in urban locations. Old Cool’s General Store is one such corner store, with decidedly throw-back signage and a website dedicated to “fostering neighborhood talent and using barter and trade”. Cone & Steiner has three locations in the Seattle area and promotes local wine alongside Seattle Seahawks’ merchandise. These General Stores offer typical household items, like coffee filters and extension cords; but they also sell gifts, and often have a great selection of local specialty food items. They rely heavily on well-merchandised “busy” shelves to create a fun, kitschy environment, packed with items that are definitely not on the essential list. These updated General Stores use modern lighting, highly curated merchandise, a wide range of specialty food items, and black and white, with occasional gold leaf, that looks as if it came from the 1800’s. All three of these trends share an element of connection to the local community – a trend we expect to intensify in the coming years. They also reference nostalgic elements that provide a vintage feel, such as natural wood, brick, stone, and typography. There is a warmth that feels welcoming, and a strong presence of local merchandise which is entirely advantageous for these shops. When making your convenience store a neighbourhood destination, these three variations on the local theme all have strong design elements that reinforce a unique place in the community.